Inspired by the dynamic Vanguard collection, the Yachting Collection develops a new creative vision of time with its nautical details. The Yachting watch features all the seafaring details: from the deep blue to the wind rose adorning the dial everything reminds us the sea world. The distinct Vanguard numerals perfectly complement the audacious design of the dial and enhance its high legibility. Sporting either an automatic movement or a mechanical one, the line is available in titanium, 18-carat gold and stainless steel and is further seen in four variants – classic, chronograph, tourbillon and Gravity tourbillon. This timepiece is the ideal sporty watch for the owners of a yacht as the two universes share the same elegance and technical features. Each watch comes with a rubber and alligator strap. 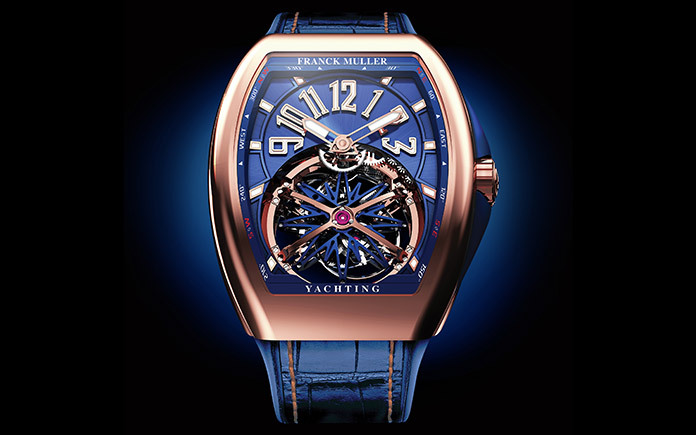 Global precision meets yachting sport design in this avant-garde artwork.